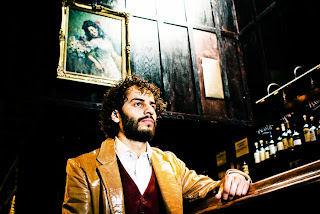 Brooklyn's Two Cent Revival, the new project from Brazilian-born, Texas-raised singer/songwriter Matt Jones, mixes folk-tinged Americana and classic country elements with dark lyrical themes and an acoustic-focused rock band. Driven by Jones' baritone vocals, the songs hint at wooden barrooms and dusty churches, walking the line between failure and redemption. On The Devil's in This Whiskey, Two Cent Revival's upcoming release due in early 2011, Jones and his band add a harder edge to the sound he began developing on his previous release, Butter and Rum (2008). Produced by Alex Houton (Charlotte Sometimes, Bailey Grey), the new five song EP features a 1971 Fender Telecaster, a late 1930's Gibson Kalamazoo acoustic guitar, and a Kentucky mandolin to create a distinct vintage workhouse tone with a modern Americana bite. Written and arranged over three months between NYC and Red Bank, NJ, Jones’ goal was to create a sound that was both musically appealing and lyrically interesting. “I wanted to be able to talk about (stuff) on my mind, which wasn’t necessarily happy, but have it still be catchy,” he said. With driving electric guitar and vintage acoustic guitar sounds, The Devil’s in This Whiskey was heavily influenced by Jones’ longing for his southern and southwestern roots. “I used to live on the bayou in Texas, where we’d drink cheap beer barefoot and hang out from late afternoon until well past sunset. I distinctly remember the smell of freshly cut grass and the whine of the mosquitoes in the summer,” he said. Jones’ predilection to the sights, sounds and details of home, evident only after his move to New York, has transformed him into an exceptional songwriter. Jimmy Norman, co-writer of "Time Is On My Side" said “Matt Jones [has] a lot going for him: his stage presence, his interesting, original songs, and especially his phrasing. He is a great storyteller." It’s no surprise then, that Jones’ influences include Bob Dylan and Townes Van Zandt (“who once said, and I paraphrase, that he puts all of his sadness in his songs so he can live his life”) to Creedence Clearwater Revival, Tom Petty, Tom Waits, and the more contemporary Ray LaMontagne. Look for the release of Two Cent Revival’s The Devil’s in This Whiskey in early 2011.